In 1921, the widow of Albert Goodwill Spalding donated his voluminous archive of baseball photographs, manuscripts and books to the Astor-Lenox and Tilden Foundation of the New York Public Library. Spalding assembled the collection in conjunction with his release of the 1911 book America’s National Game and it was comprised of his own personal papers and scrapbooks and the personal archives of baseball pioneers Harry Wright and Henry Chadwick. Chadwick gave Spalding his baseball library in 1907 and a year later via his last will and testament, he bequeathed the remainder of the archive. Chadwick’s collection also included the records, score books and rule books of the pioneer Knickerbocker Base Ball Club which he acquired from former club president James Whyte Davis. Harry Wright, in similar fashion, bequeathed his entire baseball archive to the National League in 1895 as part of his last will and testament where he noted specifically his wish for his baseball library to serve as “a nucleus or beginning of a historical collection” to preserve the history of the game. Spalding likely acquired the trove when he served as the National League President in 1902 and until his death in 1915 maintained Wright’s archive of photographs, scrapbooks, diaries, financial ledgers, correspondence, score books and rule books documenting Wright’s affiliations with the Cincinnati and Boston Red Stockings and the Philadelphia Nationals from 1868 through 1894. (L to R) A.G. Spalding; Harry Wright; Henry Chadwick; Dorothy Seymour Mills; and John Thorn. The Spalding Collection constituted the most significant holding of 19th century baseball artifacts and documents in existence and from 1922 through the 1970s the collection served as an important resource for historians like Charles Mears, Robert Henderson, Dr. Harold Seymour and Dorothy Seymour Mills. Access to the collection also helped to establish the formal endeavor of baseball scholarship with Dr. Seymour’s 1955 dissertation at Cornell University and the release of the ground-breaking book Baseball: The Early Years published by Oxford in 1961. In the early 1980s, members of the Society For American Baseball Research (SABR), including author and historian John Thorn, continued to utilize the Spalding Collection for research purposes and in 1983 Thorn spearheaded a campaign with SABR and The Sporting News to preserve and microfilm the manuscript materials. In the course of microfilming the collection, however, Thorn realized that a significant number of manuscripts and scrapbooks were missing from the library’s Fifth Avenue Branch. Three of the scrapbook volumes missing included the incoming correspondence of Harry Wright between 1868 and 1894 and included thousands of documents dealing with Wright’s day to day operations. The NYPL staff documented the missing manuscripts in a 1983 report and four years later they conducted another inventory of the Spalding photographs and discovered a large portion of that collection was missing as well. Barry Halper owned thousands of items stolen from the NYPL and his dealer Rob Lifson was caught stealing at the NYPL in 1979. The New York Post published a 2013 report about the NYPLs failed recovery efforts. 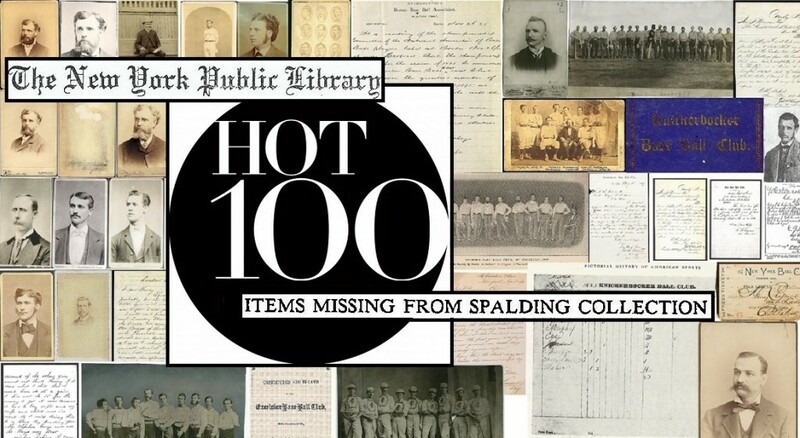 Most all of the Spalding Collection artifacts were stolen in the mid to late 1970s as part of a well-orchestrated heist said to have been masterminded by late collector and Yankees minority partner Barry Halper and his associate Rob Lifson of Robert Edward Auctions. In 1977 Halper showed off his acquisition of Harry Wright’s correspondence collection to Bill Madden in his collectibles column published in The Sporting News and in 1979 Lifson was caught stealing a cache of rare CDV photos and cabinet cards in an incident that was reported in TIME Magazine. From 1977 through 1999 the majority of stolen Spalding items were either sold by or in the possession of Lifson and Halper and Lifson’s other top customer, a stock broker named George Lyons. In 1999, Halper and Lifson sold scores of stolen items at Sotheby’s as Halper liquidated his entire collection. Although Lifson publicly denied having ever been caught stealing items from the Spalding Collection he confessed to SI.com in 2009 and admitted he was apprehended while “secreting” two 19th century photos at the NYPL. In July of 2009, a group of letters removed from Harry Wright’s missing scrapbooks surfaced in an MLB All-Star Game auction conducted by Hunt Auctions. The New York Times published three articles showing that historian Dorothy Seymour Mills had cited some of the letters in her own work and the letters were subsequently removed from the sale and turned over to the FBI as evidence in an on-going investigation into the 1970s heist. To date, only a handful of items have been recovered by the FBI and returned to the NYPL, including a rare 1869 Red Stockings trade card that was returned by Net54 moderator Leon Luckey. 1.) 1846 score sheets from June 19, 1846 Knickerbocker BBC match vs. New Yorks; 2.) 1848 Knickerbocker BBC By-Laws and Rules. 1.) 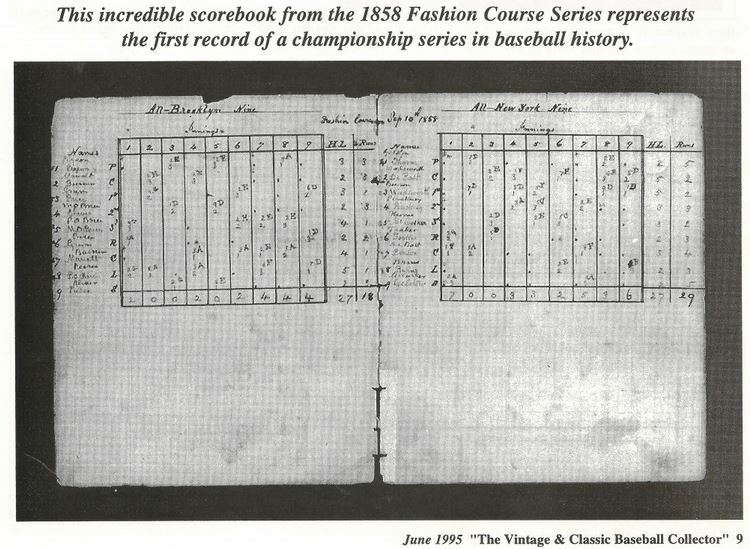 1846 Knickerbocker Base Ball Club Score Sheets from June 19 match versus the New York Club. 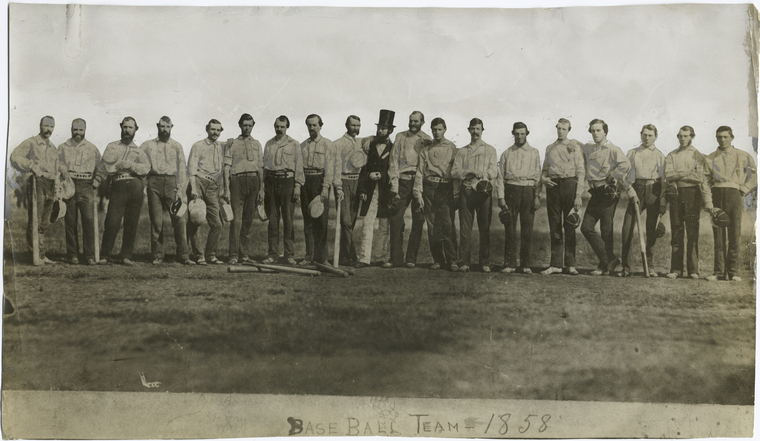 Long considered baseball’s 1st game before recent scholarship has unearthed earlier contests. These sheets were cut out of the NYPL Knick score books with a sharp object and were discovered missing by MLBs official historian John Thorn. 2.) 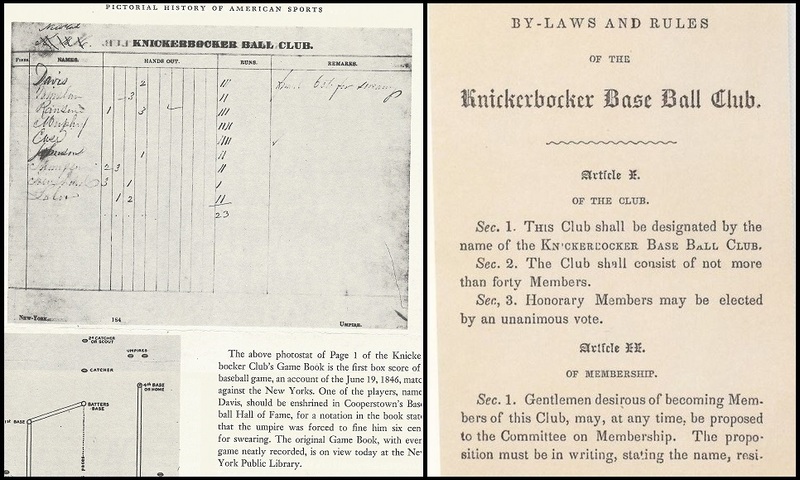 1848 Knickerbocker Base Ball Club By-Laws and Rules once owned by James Whyte Davis (along with the 1866 Knick BBC By-Laws and Rules) The 1848 By-Laws were originally sold to Barry Halper by Rob Lifson (although Halper lied to Connoisseur Magazine in 1990 and said a collector who had no idea what the booklet was “threw it in” to close a deal). In the 1990s Halper sold the By-Laws in a private sale brokered by Lifson to collector Corey R. Shanus. 3.) Harry Wright's Correspondence Scrapbook Vol. 1 1866-1877 (about 50 letters/documents removed from this volume appeared for sale in the 2009 MLB All Star Auction conducted by Hunt Auctions. 3.) Correspondence Scrapbook of Harry Wright Volume 1- 1868-1877. Many letters removed from this volume appeared in a 2009 Hunt Auctions/MLB auction. The FBI took possession of the letters and later returned them to the consignor who sold the entire group to an auction house owner. 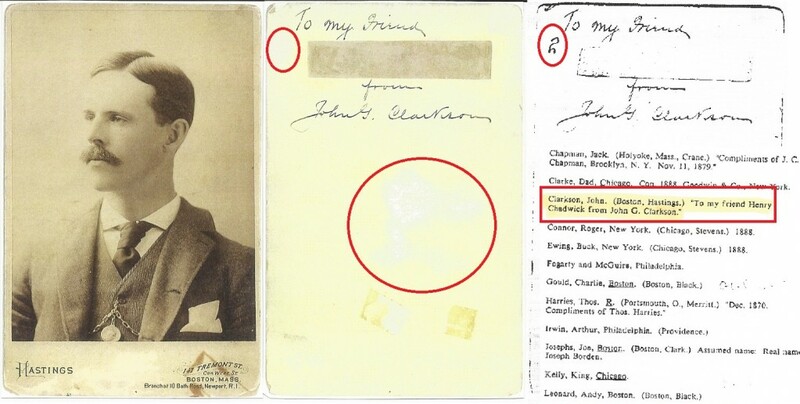 Each of the three missing Wright volumes are believed to have included over 1,500 documents. 4.) Henry Chadwick’s personal score-pages for the Fashion Course Matches of 1858-Removed from NYPL Chadwick Score Book Vol. 20. Brooklyn dealer Barry Sloate noted his “discovery” of these pages in VBBC in 1995 and sold them to collector Corey R. Shanus. 5 and 6.) Harry Wright Correspondence Scrapbook volumes 2 and 4. In 2009, the NY Times published articles showing that letters removed from these volumes were for sale in an MLB/Hunt auction. 5.) Harry Wright’s Correspondence Scrapbook 1884-1889. This missing volume once included several thousand letters, contracts, telegrams and other pieces of ephemera. Most all of these items ended up in the collection of NY Yankees minority owner Barry Halper. 6.) Harry Wright’s Correspondence Scrapbook 1889-1894. Many of the documents in this scrapbook were removed and sold off by collector Barry Halper. The documents were scattered all over the country in various different collections. 7.) 1/2 of Henry Chadwick's score book Vol. 20- 1858-1859. Including Jim Creighton games with Star of Brooklyn. 7.) Half of Henry Chadwick’s personal score book volume from 1858 and 1859. Also “discovered” by Brooklyn dealer Barry Sloate, this 1/2 volume is the companion to the NYPL’s Chadwick scrapbook vol. 20. Sloate’s 1/2 volume even included the glossary for the entire volume including the sheets remaining at the 5th Avenue library branch. 8.) A. G. Spalding’s personal scrapbook spanning from 1868 to 1874. This entire volume is believed to have contained original CDV and cabinet photographs, scorecards, letters, contracts and other priceless artifacts that have since been dismantled and sold on the black market of baseball artifacts. 9.) 1859 panoramic Photo of Knickerbocker and Excelsior Base Ball Clubs by Williamson, Brooklyn. 9.) 1859 Photograph of the Knickerbocker and Excelsior Baseball Clubs by Williamson. A letter at the Baseball Hall of Fame suggests that this photo was loaned to Cooperstown in 1938 but its whereabouts are currently unknown. 10.) Autographed Hastings cabinet photo of John Clarkson inscribed to Henry Chadwick. 10.) Autographed cabinet photograph of John Clarkson inscribed to Henry Chadwick. This cabinet photo was owned by Barry Halper and collector George Lyons and had the “Henry Chadwick” inscription removed to conceal its NYPL provenance. 11.) 1859 Knickerbocker Challenge Letter sent to the Eagle BBC from Knickerbocker Correspondence Scrapbook Vol 1. The letter shows evidence of beind ripped from another page and the jagged edges fit perfectly with the second page of the letter still pasted in the scrapbook at the NYPL. 11.) 1859 Knickerbocker Base Ball Club Challenge letter to the Eagle BBC. This letter was sold at the 1999 Barry Halper sale and shows definitive evidence that the letter was wrongfully removed from the NYPL Knick Correspondence scrapbooks. The second page of the letter is still pasted in the Knick Scrapbook at the library. 11.) 1879 player contract of Ezra Sutton with Boston BBC, signed by Harry Wright. This contract was documented as NYPL property in letters sent to Dr. Harold Seymour in 1953 (inset). The contract was in the collection of Barry Halper and was hung on the wall in his office from 1977 to 1999 (inset left). 15.) Tommy McCarthy autographed tintype photo; 16.) Ed Delahanty letter to Harry Wright 1887; 17.) Alexander Cartwright Tabor cabinet photo; 18.) 1874 autographed Harry Wright Warren cabinet. 20.) 1875 letter to Harry Wright presenting Boston the 1875 Pennant (documented as NYPL property in Dr. Seymour's research notes (center). 21.) 1874 AG Spalding letter to Harry Wright from World Tour in England. 25.) 1887 Harry Wright Kalamazoo Bats cabinet; 26.) Harry Wright's signed 1868 Red Stocking Membership; 27.) 1866 Brooklyn Excelsiors By-Laws; 28.) Vandalism shows theft of Harry Wright's 1863 Knick resignation letter. 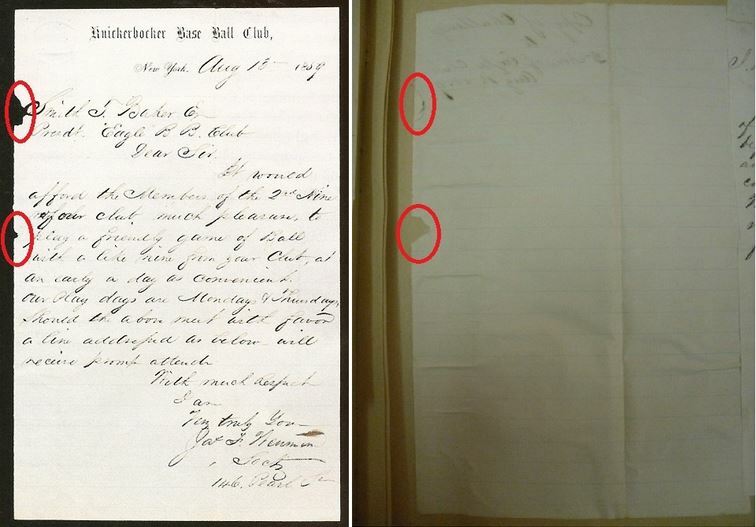 Challenge letters stolen from NYPL Knickerbocker BBC correspondence scrapbook (l to r): 1859 Excelsior to Knick; 1859 Star to Knick; 1869 Hamilton to Knick; Continental to Knick (still at NYPL). 78.) Harry Wright tintype photograph by Heiss, Cape May NJ. 80.) 1891 Boston BBC mounted albumen photo on score card. Harry Wright tintype photo; 1887 Brooklyn vs. St. Louis panoramic photo; Deacon White CDV photo by Warren; 1891 Boston BBC photo on scorecard. As a result of the 1970s heist, the NYPL’s A. G. Spalding Collection has been significantly diminished and the NYPL has failed to recover scores of items residing in several private collections.